What makes WebSockets especially compelling is that they allow you to extend the reach of enterprise protocols, like JMS, XMPP and AMQP, all the way to the browser. 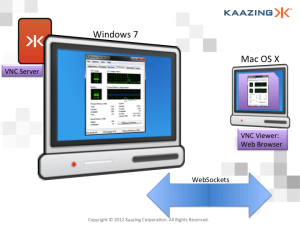 In this demonstration I show an example of implementing the VNC protocol, RFB, over WebSockets. This 3 minute demo features a windows machine running a VNC server. The Windows desktop is accessed remotely from a vanilla Safari browser, simply leveraging the canvas tag and WebSockets. First you see an environment Windows running as a virtual machine, then I show two physical machines connected, and last I walk through the building blocks used for the demo.